If you're sick of the endless stream of "likes" and "favorites" on your social networks, then the new Appathy concept app may be the cure for what ails you. Use of this tongue-in-cheek app promises to balance out all the meaningless positivity on your Facebook feed. Every time one of your friend requests is blocked or a friend mocks one of your tweets, Appathy is designed to let you know and-in the process-to keep your ego in check. For the moment at least Appathy is just a concept, with an impressive mock-up of what the finished product might look like. The work is the brainchild of an interactive agency called Arc90 that conceived of the app as a way to add meaning back to our social media lifestyles by balancing it out with a little bit of negativity. Which makes sense, if there's anything real friendships have that social media leaves out it's our friends being jerks. "What if there was a tool that pings you when your online activity conjures up little more than indifference and apathy from others?" Arc90 asks in its explanation of the app "Wouldn't the occasional "friending" mean so much more?" Appathy is one of a trio of hypothetical apps from the agency. 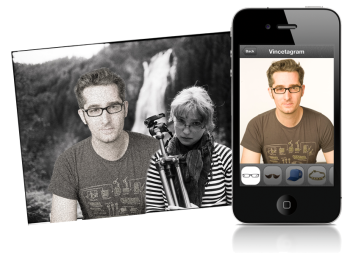 The company has also unveiled Vincetagram, a parody of popular photo-filter app Instagram, that adds a friend named Vince (who looks suspiciously like DIY tech superstar Bre Pettis, founder of the Makerbot 3D printer company) to all of your photos. The final Arc90 concept is the darkly comic existential GetaGrip, a location-aware app that would help remind you of your own mortality. The app would keep track of how many of the songs at your prom are now considered oldies for instance, and let you know about all of the terrible tragedies that have occurred in history near your current location. None of arc90's apps are likely to be a hit on the iTunes store anytime soon, considering that they're all huge bummers. But these apps aren't so much products as they are tongue-in-cheek jokes about how we interact with technology. And we seem to see contrarian apps popping up all over the place lately. One of the most recent was an Augmented Reality app that replaces ads in billboards in Times Square.